Grace Brethren Army Chaplain Capt. 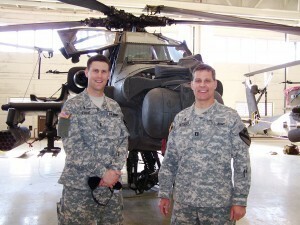 Pete Stone, right, is pictured in front of an Apache helicopter with fellow FGBC chaplain, Capt. John Jacobsen. Grace Brethren Army Chaplain Capt. Pete Stone, who is stationed at Fort Campbell, Ky., was among those tasked with notifying family members of those killed in the recent crash of a UH-60 in Afghanistan. It was his first time to make such a notification. Pray for our Grace Brethren military chaplains who minister in circumstances that are often very difficult. To learn more about the Grace Brethren men who serve as chaplains in the military, see the Eagle Commission.